Cormate boats are engineered and developed by Hydro Design AS of Norway. On water testing of prototypes is done at our service and test center in Fredrikstad. Hydro Design has more than 30 years of experience in the development and production of high quality boats with outstanding performance and seaworthiness. Hydro Design has its origins as one of Europe's leading manufacturers of offshore racing boats, this has contributed to irreplaceable knowledge of hull designs, manufacturing techniques and materials. The heritage and the racing genes live on through today's products. Hydro Design has over 30 years experience of building boats that had to withstand a combination of rough sea conditions and high speeds. Through our experience with racing construction we have developed a building technique that delivers an optimal ratio between construction cost, weight and strength. The Cormate production Tools have all been developed by CAD/CAM technology and produced in full scale with CNC milling. Hydro Design was one of the first boat builders in Europe to exploit this technology. The first CAD drawings were conducted in 1993 and the first 3D models were made in 1999. CAD and 3D modeling are used throughout the design process, from the construction and stability test of the hull to the planning of wiring and cabling. Hydro-Design was founded in 1985 by Egil Ranvig. Together with his friend Tom Martens Meyer, Ranvig developed the enterprise from producing affordable waterski boats to increasingly sophisticated racing boats. These boats won countless Offshore races, including European and World championship races and they also set world speed records. The racing boats were not only sold to Europe, but also to the USA, UAE and Japan. From 1989 Hydro Design also began to produce center console boats and established the renowned and highly regarded Hydrolift brand. The first models, F-18 and F-20 are today sought after classics. With ever new models being produced, the company evolved to become a distinct player among recreational boat manufacturers. In 1999 Ranvig sold the manufacturing rights and left the business, but missing royalty payments resulted in Ranvig regained the production rights and his old brand name. Later the Hydrolift name and the rights to T-30 and S-24 hulls were taken over by Bård Eker, who has since then run the Hydrolift company to its new heights. Hydro Design continued to produce the original models and new RIB's under the name Stormway. This business was sold fairly quickly and the idea of yet another brand was conceived. Along with Frode Svendsen, his old brother in arms from the Hydrolift era, Ranvig could now realize the dream of a new concept. The goal was to produce high quality boats with excellent seaworthiness and timeless lines, but with a revolutionary layout adapted for today's lifestyle. These boats were entirely constructed by CAD/CAM, without ties to former construction and building techniques - the Cormate boats saw the light of day. By the première display at the international Norwegian Boat Show in 2006, the CormateT-27 was awarded the "The Boat of the Year" prize. At its second international première 9 years later, it was awarded the "Boat of the Show" at the international boat show in Warsaw. In 1993 the Hydro-Design factory team with driver Tom M. Meyer set a new UIM world speed record in the Offshore 6 liter class. The boat was a Hydrolift CR-28 design by Egil Ranvig. The two Mercury 2.5 EFI engines producing a total of 560 hp. The speed was measured at 204 km/hour one way. Average speed both ways was 192.25 km/hour. The RIBCAT world speed record project was conducted by Mats Lingren/RIB Unlimited in 1999. It was a revolutionary 38 ft RIB catamaran designed by Egil Ranvig. 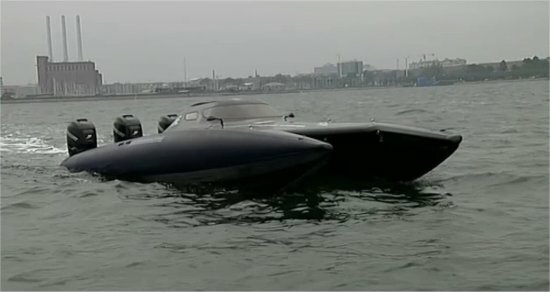 The boat weighed more than 3 tons, but still obtained 101.8 knots (188.5 km/hour) with a single 750 hp V-12 Lamborghini engine. It was the first RIB reaching the 100 knot barrier. The revolutionary catamarans of Egil Ranvig dominated the racing scene in Europe during the 90's. But they were not only winning races in Europe, they were also achieving victories in the UAE, USA and Japan. As late as 2006, Thomas Rosen won the world championship in a modified Hydrolift CR-24, originally design by Ranvig in 1990! The picture shows Risto Korja in a CR-26, winning a 6L Word Championship race in Dubai (1994). Rekorden dansk igjen To dansker knuste den norske rekorden fra Oslo til København i dag. Ribcat one sets new record between Oslo and Copenhagen . The boat is Norwegian produced and designed by ﻿﻿Egil Ranvig.